Ending extreme poverty is essential to save lives and limit damage from disasters, U.N. chief Ban Ki-Moon said, as figures revealed poorer nations bear the brunt of deaths from earthquakes, tsunamis, floods, storms and heat waves. 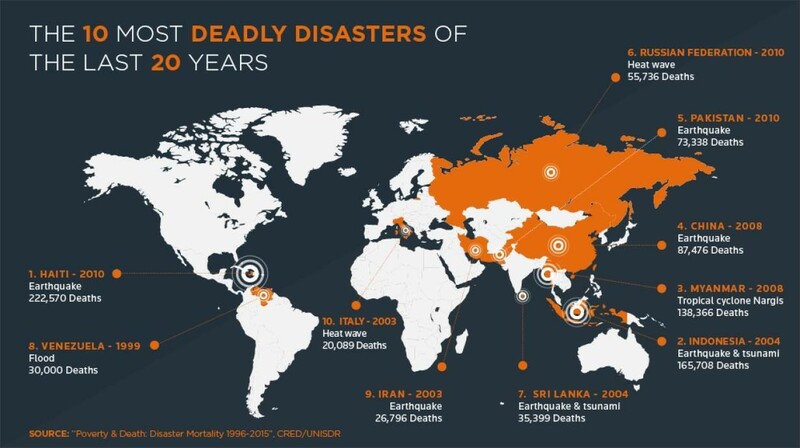 An analysis of more than 7,000 disasters over the past two decades, in which 1.35 million people died, showed 90 percent of those deaths occurred in low and middle-income countries. Ban called it "a damning indictment of inequality". The impoverished Caribbean nation of Haiti, which suffered a devastating earthquake in 2010, lost more lives than any other country between 1996 and 2015, said the study issued by the U.N. Office for Disaster Risk Reduction (UNISDR) on Thursday. Last week Haiti was struck again when Hurricane Matthew killed at least 1,000 people and left around 1.4 million in urgent need of aid. "High-income countries suffer huge economic losses in disasters, but people in low-income countries pay with their lives," said Ban in a message for the annual International Day for Disaster Reduction . Earthquakes and tsunamis were the biggest killers overall in the past 20 years, followed closely by climate-related disasters, which are increasing in number as the planet warms, according to the report. Ban warned "hundreds of millions of people" are at risk of rising seas, earthquakes, and climate and weather extremes. "They live on marginal lands, beneath unstable hillsides or on storm-exposed coastlines," he said. "This is why eradicating extreme poverty ... is essential to reducing disaster risk." Last September, world leaders agreed to end poverty by 2030 as part of a new set of global development goals. The number of people living in extreme poverty fell by more than 100 million to 767 million in 2013, the World Bank said earlier this month. On average the death toll per disaster in low-income countries was five times more than in high-income countries which have more effective early warning systems and better preparedness, according to the Centre for Research on the Epidemiology of Disasters, which collects the data. The UNISDR praised examples in developing countries where efforts to protect people have paid off. They include Fiji, where early warning and action by the authorities helped limit the death toll to 44 earlier this year from Cyclone Winston, the most powerful storm to hit the Pacific island nation. In India and Nepal, the NGO SEEDS has provided housing that can resist earthquake and cyclones in poor communities. And Nigeria's health ministry was recognised for stopping Ebola from taking hold when the pandemic was at its height in West Africa. UNISDR head Robert Glasser highlighted the role of climate change in increasing the risks of disasters around the world. The report said the number of weather and climate-related disasters had more than doubled in the last two decades compared with the preceding two. All nations are being affected, including richer countries that have suffered tens of thousands of deaths linked to heat waves in particular. But the poorest are still far more likely to die. Glasser compared Cyclone Nargis, which hit Myanmar's coast in 2008 resulting in 138,000 deaths, to the zero casualties in Australia when top-strength Cyclone Yasi slammed into Queensland in 2010. "The irony is that those countries that have contributed least to climate change, to this crisis we face, are the ones that are being hit the hardest in terms of loss of life from... these increasingly frequent and severe weather and climate-related events," Glasser told reporters in Geneva.